The deliciously talented Lu sisters have released a new fall collection. Last season's collection was based on spring flowers. Their fall line is based on feathers. Lots and lots of feathers. The Lus are well known for their exquisite primwork, their hand-drawn designs, and their sense of whimsy. This latest offering is no exception. Rich colors permeate the offerings. Deep vibrant reds and purples. Electric yellows. The Parakeet above (300L$) is eyecatching with its beads and froufrou prim feathered epaulets. The Night Heron (350L$) is a lovely mauve confection, layered with brown and white prim feather trim, and multiple textured flexi skirts in contrasting colors. The hand-drawn drape across the bodice is very nicely done. Very flattering and luscious. The feathery textures on the prim trim are layered beautifully. 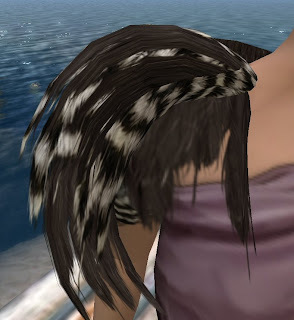 The feathered prims have a naturalistic sheen to them and a slight transparency that suggests a realistic lightness and softness. The Lush ballgown is eyecatching with its combination of purple and crimson (450L$). The Cardinal (600L$) is covered all over in a feathery texture - the deep reds are eye-popping. The famous Alt sisters - I mean Lu sisters - tend to design toward the elegant, and these ball gowns are just over the top. The Gilded Peach (350L$) is a classic with sequins and a side skirt. The Magpie (600L$) is a beautifully understated draped black and white gown with multiple flexi skirts and a long train. The waist is banded with sculpted draped fabric and the bodice is intertwined black and white textured fabric. Luscious! The texture on the Sequin Finch gown (300L$) is so deep and rich as to be mesmerizing. Lovely blues and golds adorn the high waisted skirt, and poofy sleeves and a sparkly brooch keep it in place. Simpler offerings are the Turtle Dove (400L$) a subtle skirt and blouse with matching feathered cloche evokes the working girl of the 1040's. The Pica (280L$) is white, with cutouts and a black underlay and a beautiful gauzy sculpted wrap is perfectly draped. For all the work that goes into the Paper Couture collections, their prices are very reasonable, expecially compared with some of the lesser quality stuff that's out there. I make it a point to visit regularly, and I usually get several items. They've branched off into purses and jewelry and shoes and eyeglasses as well, so you can accessorize your outfits as needed. This visit, they got me for three outfits. They remove all their old items with each new collection, so get them while you can. Some of my most highly complimented outfits come from Paper Couture - even the ones that are rapidly approaching "vintage" status. Keep up the good work, Paper Couture, your efforts are appreciated, and your sense of humor is priceless. The House of Lu/ Paper Couture is located in the main square in Tableau.